By spring 2002 the building had been completely neglected for a dozen years. It had been largely ignored for another dozen. Most of the roof was 30 years old and had leaked for some time. The original framing, a combination of a timber and stick frame, had suffered several major "re-structurings". 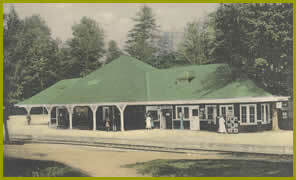 A few posts and floor joists had replaced the interior walls of the one-time commercial establishments residing inside the station. The center of the building was one open space except for the additional posts. 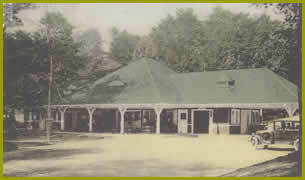 The center overhang on the east side was enclosed completely in the 1970's to create four stables. The pass-through on the north end also had been enclosed to create a car garage. The triple-folding entry doors on the east side of the former luggage storage area - next to the pass-through - had been removed and replaced by windows. The elegant octagonal structure on the south-west side of the building was completely removed at some time after 1971. Roof leaks had badly damaged large sections of the roof overhang on all four sides of the building. Some of the major roof support timbers needed repairs as well. 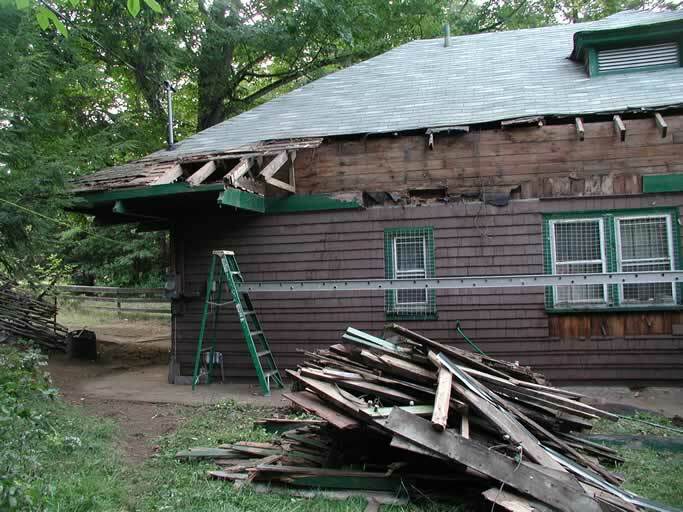 The original roof was cedar shingles. A second layer of asphalt shingles was on top of the (rotting) cedar shingles. On the South side, new sheathing and a third layer of fiberglass shingles had been laid over the old cedar and asphalt shingles early in the 90's. The center of the building had settled several inches and some of the outside posts of the center overhang had heaved due to frost; this placed a lot of stress on parts of the overhang structural supports. Water damage to sections of the attic floor (also the ceiling of the first floor) was extensive. The concrete platform in front of the station had badly deteriorated. 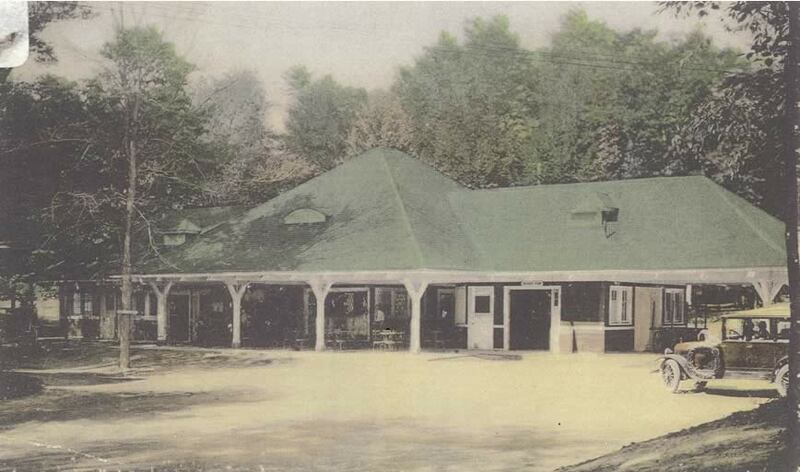 On a more positive note ... Sacandaga Park has a water and sewer system that goes back to the FJ&G period. 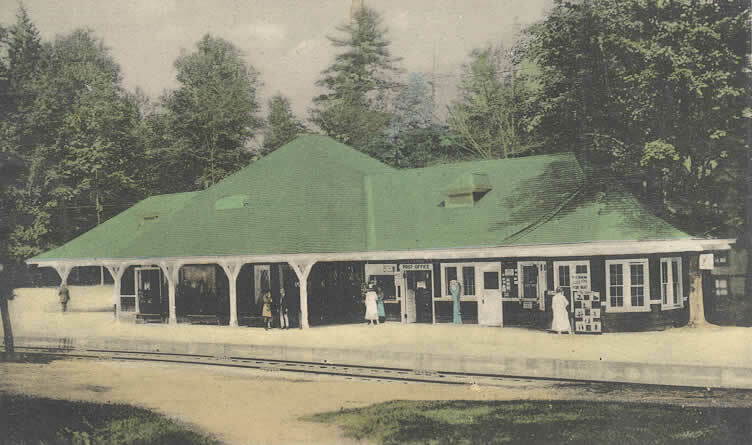 As a result, the Station (which in the 20's saw thousands of customers on a busy summer weekend) has a generous sewer connection. A water main runs (six feet underground) in front of the station where the train tracks used to be. The leaking main roof was the most serious condition by far. Because of the resultant damage to the framing of the roof overhang and decay in some of the main roof timbers, it was necessary to repair all of the roof-related exterior woodwork ASAP. The downside of this was that some of the structural settlement was difficult to correct later on. The roof overhangs were completely replaced in sections on the east side of the building. Other sections were selectively repaired. The heavy timbers underneath the overhang are largely decorative - most of the load (especially during heavy snow fall) is carried by triangulated framing that is bolted on to the ends of the rafters. Part of the load returns horizontally to a plate on top of the exterior wall. 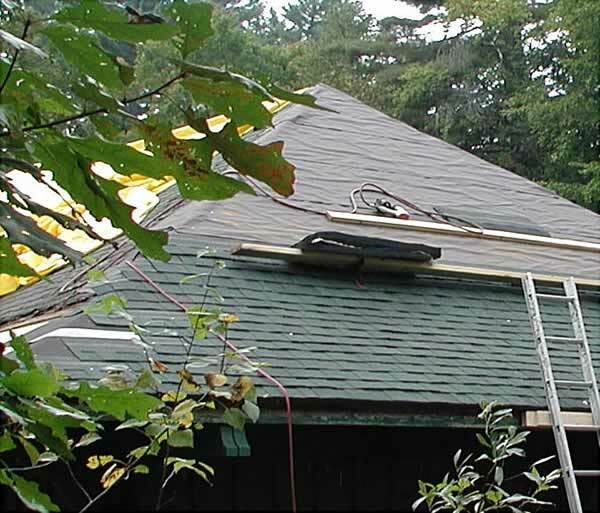 This construction makes it easy to repair the overhang independent from the main roof. It also places a lateral load on the wall. The heavy timber running on the outside along the length of the overhang aims to keep the overhang roof line straight between posts. Replacing sections of this timber and making the overhang roof line straight in the presence of eighty years of settlement, proved to be time consuming. 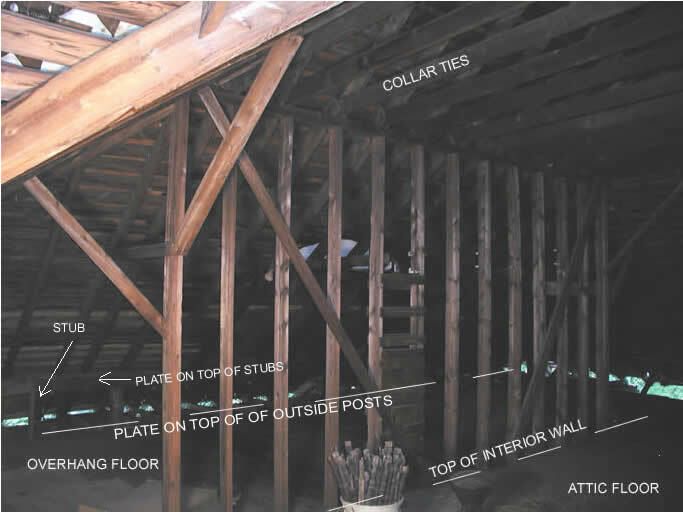 The rafters of the center roof rest on plates (double 3*10's on edge) that are elevated from the attic floor with short (approximately two feet) stubs. The stubs rest on a similar set of plates that rest on top of the main building posts. Although this is a strong construction (and it has held up for the past 80 years), the more or less free-standing stubs are sensitive to lateral movement of the wall that supports them. Settlement of the roof ridges particularly at the two points where the horizontal ridges meet the pyramid, as well as heavy snow loads on the overhangs, cause opposing lateral pressures on the plates - inward on the lower plate and outward on the upper one. As a result, several of the stubs were visibly out of the vertical plane. Knee walls (instead of stubs) are used on the south end of the building and above the former baggage room. However, these walls were weakened by decay to the point that the whole wall was bowed. Two of the four sets of hip rafters that extend from the top of the center (pyramid) roof to the corners, needed repairs. One of the ridge beams had cracked in the area of greatest (snow load) pressure - where the ridge meets the pyramid roof. That part of the roof structure appeared to be under-designed. However, most of the roof framing was in surprisingly good condition with the exception of areas around the six dormers. The Station has a rather large roof - close to 80 squares! 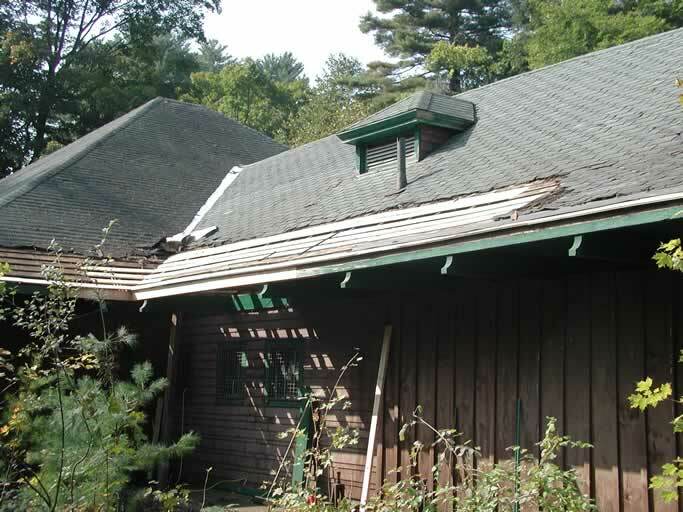 All shingles were removed, defective roof boards were replaced and overlaid with plywood before installing forest green architectural-type laminated asphalt shingles. The six dormers - three on each side - were repaired and restored to their original function - ventilating the attic. Additional roof vents were installed on the roof ridges. The center pyramid roof was strengthened with double laminated beams that support the pyramid roof rafters near where the north and south roof ridges intersect with the pyramid roof. Significant changes to the load-bearing structure of the building were made in the 1970's when the use of the center section was converted from several commercial establishments, to a horse stable with five stalls. The four walls that were part of the interior partitions and which ran over the width of the building had been entirely removed. The plates that were originally on top of the two walls closest to the center of the building - these two walls enclosed the main concession area of the station - were preserved in the ceiling when the walls were removed. A new beam was then run in the length direction underneath those plates. This beam was located well off-center. Posts were placed at the intersection of the old plates with the new lengthwise beam. New beams were then installed between both sides of the new length-wise beam and the outside walls, at the locations where the other two interior walls used to be (these are at the locations where the ceiling height changes). Two more posts were added where these beams intersected the length-wise beam. This made for a total of four posts supporting the center attic. A series of over-sized nailers were toe-nailed between the length-wise beam and the outside walls over the entire length of the attic. A new ceiling of rough planks was then nailed underneath these nailers to complete a "barn-like" look for the entire center section of the building. Two large square openings in the first floor ceiling gave access to the attic - to be used as a hayloft! No additional changes were made in 1987 when the building became an artist studio and workshop. 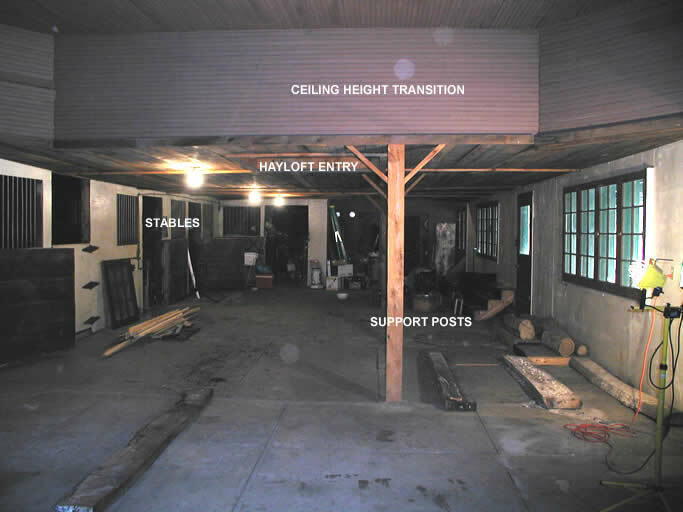 To adapt the center section to the envisioned use we removed all of the new (1970's) structural elements supporting the attic, including the beam and four posts under the attic floor. Parts of three of the four former partition walls were re-installed as functional partitions and to help support the ceiling. Laminated beams were used to bridge missing wall sections. A series of 12" deep parallel floor trusses were then installed on the attic above the old ceiling. These trusses extend over the width of the building. They allow insulation, piping and electrical wiring to be placed between the first floor ceiling and a new attic floor installed on top of the trusses. The trusses also served to hold up sections of the ceiling, using metal suspension plates. This allowed the first floor ceiling, which is original, to be preserved. The new attic floor created a wonderful eclectic looking second floor (attic) that is suitable for many future uses. A new stairwell was created for convenient access to the attic. All the exterior walls were widened on the inside to improve load-bearing - including the load of the new second floor - and for the placement of thermal insulation, wiring and duct work inside the walls. A sub-floor was built six inches above the existing concrete first floor. This allowed for floor insulation and piping for a building-wide water and heating system; it also made a level floor! The electrical system was replaced throughout the entire building. The apartment on the south side was gutted, slightly expanded, ceilings raised and then re-built. The building is now designed for multiple uses. The center area is suitable for a community meeting place, exhibit area, a professional office or a 3-bedroom living space. It includes a kitchen and bathroom. Part of the space can be readily partitioned. There is an additional 1200 sqft of space on the second floor (attic). The former luggage room on the north side is used as a workshop and instructional space. The south-side apartment is completely self-contained with a kitchen, bathroom and one bedroom. It is separated by a firewall from the rest of the building. It functions as a full-time occupied caretaker apartment. Click here to learn more. The time line of the restoration has been documented here.